The respectable brick terraces of east Brighton, beyond Queen’s Park and behind Brighton College, were developed after 1870. A temporary church was soon built and within a short time E E Scott and R S Hyde produced designs for a permanent one (ICBS). 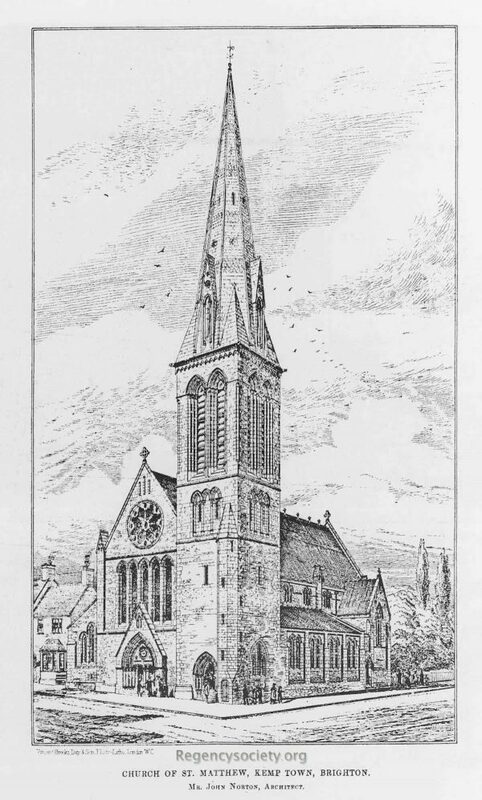 However, the architect of the church that was built between 1881 and 1883 at a cost of £11,400 (KD 1899) is given as J Norton (B 37 p526), though a rather ambiguously phrased note attached to the ICBS note implies that Scott and Hyde’s design may not have been discarded totally. The church was substantial and in C13 style. The exterior was faced with flint and the interior with brick, but in fact the walls were of concrete, an early use of the material. Like other churches of the period, the church was relatively broad by comparison with the aisles. A south west tower was intended but never progressed beyond a stump. It was to have had long paired bell-openings and a tall broach spire with lucarnes and shows a familiarity with the later churches of G E Street. It was pulled down in 1967 and the parish amalgamated with St Mark (Shipley p19). No record of its fittings and glass has come to light.